Policies like demonetisation, hastily implemented GST and restriction on exports have wreaked havoc on potato farmers. Recently, MPs belonging to the opposition were pictured selling potatoes outside parliament. A farmer from Agra made news for sending to Prime Minister Narendra Modi a money order of Rs 490 – the profit he earned for selling 19 tonnes of potatoes. Last year, farmers dumped potatoes outside Uttar Pradesh chief minister Yogi Adityanath’s house. It would appear obvious, even to casual observers, that potato farmers in India face a crisis. At first blush, the crisis seems like a classic demand and supply problem with the manifestation of over-production of the crop in recent times. However, there is more to this story, especially the incongruous policies and responses of the government to the current crisis, which have only exacerbated the problems. The Centre, for instance,, announced Market Intervention Scheme (MIS) in December 2014 to cover horticulture and other agricultural commodities which are perishable in nature and are not covered under the Minimum Support Price (MSP). However, any practical gains of the scheme rarely trickle down to the farmers because the scheme is implemented by the Centre only on the request of state government, with the caveat that losses suffered have to be shared in 50:50 ratio between the Centre and the state government (75:25 in case of a North-Eastern state). The limited fiscal space available with the state governments in their budget, along with the electoral compulsions to take credit for any populist or welfare measure, obviously refrain states from opting for this scheme. There are some state-specific interventions to immune farmers from adverse price shocks. They include, for instance, the ‘Bhavantar Bharpai Yojna’ of the Haryana government launched in 2018 and Price Stabilisation fund by Punjab government in order to ensure that farmers get the MSP in case of steep fall in prices. However, as always the ground benefits have hardly reached to the farmers. The first-hand account of farmers is a testimony to this fact. Dalip Singh, a farmer in Jharauli Khurd village of Shahabad Markanda, Haryana grows potatoes on 2.5 acres of his total 4 acres of land. He says the returns have been abysmally low for the past few years and this year, he has not even been able to recover his cost of production. His cost per acre was Rs 35,000 and he realised only Rs 30,000 after selling 100 quintals. When asked about Bhavantar Bharpai Yojana, he says he heard about the scheme and that it might start by the end of the next month, but the damage is already done. Due to procedural bureaucratic hurdles like online forms and verification of land records, the scheme’s chances to offer any relief are grim, he says. The falling prices in mandis accentuate the farmers’ distress. The figure below shows the monthly average wholesale prices of potato in Delhi per quintal from 2014. Firstly, these are wholesale mandi prices in Delhi but are different from the actual realisation of farmers, which is much below the wholesale prices collected from mandis after accounting for the packaging and transportation costs to the farmers. Taking these costs into account, in the current harvest season, the actual realisation struggled to cross even Rs 300 per quintal for farmers in Uttar Pradesh, Punjab and Haryana. This is not even sufficient to meet the production cost, leaving very few options for the farmers, including throwing their crops away. The figure also shows that not even in a single month after 2014 have prices been equal or higher compared to the prices in the corresponding months for the year 2014 in Delhi’s wholesale market. The impact of adverse policy shocks like demonetisation on an informal sector like agriculture is visible by the fall in the prices of potato from Rs 837 per quintal in November 2016 to Rs 410 per quintal in May 2017. Throughout 2017, a deflated trend of wholesale potato prices is observed due to demonetisation rupturing cash supply. As evident, the impact was profound as settlement of payments in wholesale mandis is mostly done on cash basis as opposed to ‘digital mode’ of payments. In addition to demonetisation, the hastily implemented Goods and Service Tax (GST) added to the woes of farmers by disturbing the supply chain. To corroborate, there is a clause for Reverse Charge Mechanism (RCM) under the section 9(3) and 9(4) of the Central Goods and Services Tax (CGST)/ State Goods and Services Tax (SGST) Act 2017 as well as section 5(3) and 5(4) of the Integrated Goods and Services Tax (IGST) Act 2017. Usually, in the case of Agriculture Warehouses and storages, there are registered companies who rent/lease the premises from unregistered private players. The former then are entitled to pay GST on these rent under the RCM provision because they are availing services from unregistered dealers. This is not eligible for Input Tax Credit (ITC) because the outward supply of agricultural warehousing is exempted from GST. The increased cost is passed on eventually to the farmer in the form of higher prices for storage by the agencies managing these cold storage and warehouses. This affects the supply and adds to the vexations of farmers by directly adding to the cost of production. Along with falling prices discussed above, what added to the distress was the implementation of Minimum Export Price (MEP) on potatoes twice in the past four years in the form of export restriction. The first MEP was deployed in June 2014, immediately after the Bhartiya Janta Party (BJP) formed the government. It was fixed at $450 per tonne of potatoes and was the first ever MEP on potatoes since the year 2001. The second MEP was put in place in July 2016 at $360 per tonne. This was soon followed by demonetisation. There seems to be no practical reason for implementing MEP in an already grim export scenario for potato export. Total exports have been less than 1% of the total production over the last decade, as shown in the table below. In such a situation, the MEP closes an avenue for the farmers to fetch a respectable price for their produce when domestic prices are at their nadir. The implementation of MEP in this case, thinking it will work as an effective economic policy tool to curb domestic inflation as rule of thumb, without taking stock of domestic conditions was a vacuous decision. 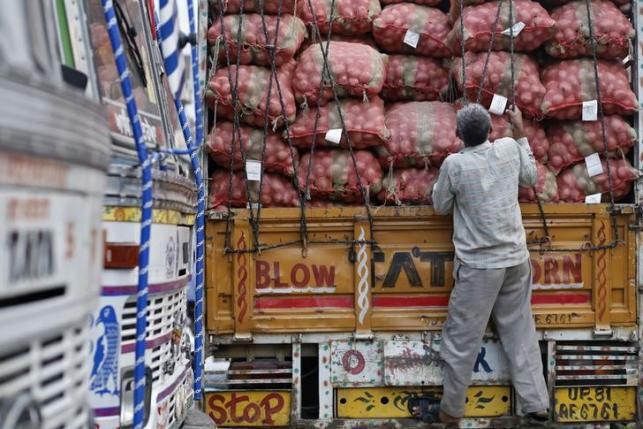 The new agricultural export policy, which was approved by the Union cabinet in December 2018, provides no relief to the wounds of potato farmers already facing the double whammy of falling wholesale prices and imprudent export restrictions. The strategic recommendations of the draft policy do not immune commodities like potato from export restrictions. Thus, the farmers of these products will continue to face the uncertainty of the tactless populist policy shocks. Thus, the ad-hoc, jarring and abrupt policies of the government like demonetisation, hastily implemented GST and restriction on exports have wreaked havoc on potato farmers. Further, if lowering wholesale inflation is what comes as a priority to appease the middle class for the current government, then it has inflicted a high cost on farmers. A comprehensive and systematic policy-based intervention which is targeted at farmers’ welfare is the need of the hour. Anmol Waraich and Mohit Kumar Gupta are PhD research scholars at the Centre for the Study of Law and Governance, JNU.